As briefly mentioned in the main entry, it's a little hard to say what a hadrosaurid is. The Hadrosauroidea have a standard cladistic definition: all iguanodontians closer to Hadrosaurus than to Iguanodon. This is a smidgen unclear since we don't know exactly where in the Iguanodontia the hadrosaurs branched off. There is even some support for the idea that the lambeosaurines and hadrosaurines may be separately derived from the Iguanodontia. However, the fact that we don't know what goes into the hadrosauroid box doesn't mean we aren't defining the box properly. Matters are otherwise with the hadrosaurids. There are two current definitions of Hadrosauridae: (1) the last common ancestor of lambeosaurines, hadrosaurines, Telmatosaurus, Secernosaurus, and (one supposes) now Protohadros, and all of its descendants; and (2) only lambeosaurines plus hadrosaurines sometimes called "Euhadrosauria"). Brett-Surman 1997). The first definition seems hopelessly ad hoc. The second leaves a large, ugly mess of stem species between Hadrosauroidea and Hadrosauridae. Most writers, with the notable exception of Sereno, surrender to temptation and put a name to what is a essentially a grade or phenetic level between Hadrosauroidea and the Late Cretaceous lambeosaurines and hadrosaurines. That unprincipled practice will be followed for purposes of this essay. For those purposes, we may disguise our immoral behavior by defining Hadrosauridae as the LCA of Protohadros and Hadrosaurus. However, by means of winking, smirking, and secret paleo hand signals, we will know that it really means "something that seems to be more than half-way to Hadrosaurus from Iguanodon." Head (1998) believes that Protohadros is the most primitive hadrosaurid known, and this specimen does seem like a good place to start. It is from suitably early in the Cretaceous and really does look like an illegitimate cross between a Muttaburrasaurus and a wanton hadrosaurine. As we will see, it may not be quite that simple. However, like the site of the Dallas-Ft. Worth airport near which Protohadros was found, they had to put the thing somewhere, and half-way in between was as good a spot as any. Having picked that spot, let us look around. Some 95 My before the city fathers of Dallas and Fort Worth floated their bond issue for the airport at Flower Mound, the bloated corpse of a recently deceased hadrosauroid floated out into the quiet waters of a little bay near the western edge of the Interior Sea. As with many a bond issue, the warm gasses generated by corruption soon ceased to be enough to support the dead weight. It sank and was duly covered with sediment. Many years later, an enthusiastic engineer from the Texas Highway Department apparently blew most of the fossil into dust with high explosives. However, a reasonably complete, if disarticulated, cranium remained. This was discovered by Gary Byrd of Dallas in 1994 and was eventually described by Jason Head as Protohadros byrdi. One of the annoying things about paleontology is the barrage of bone names and descriptions. Even after one gets used to the names, it is hard to see how and why the thing fits together. Fortunately, it is relatively easy to describe the cranium of hadrosaurs as a series of structural units which fit together in a sensible way. This is not to say that the biomechanics are easy. The way parts move relative to each other is often a factor of many variables other than bone shape. But at least the cranium, considered as a static structure, makes pretty good sense. Perhaps the best way to look at this description is as a series of architectural analogies which may help in getting a feel for the stresses and interdependencies of the skull. The skull of Protohadros is not complete. The palate, jaw suspension and braincase are present only in parts, the rostrum was shattered, and a good deal of the nasal and premaxilla are missing. Some bones are missing entirely from the dorsal skull (the "skull table"). The structure of the dermal bones is fairly standard, and we may fill in the gaps from the surprisingly similar hadrosaurine, Gryposaurus, or other relatives as illustrated in Weishampel & Horner (1990). The braincase will, frankly, be glossed over for now. The reconstruction at right (Fig. 1) is adapted from Head (1998). For some reason, I was unable to obtain complete correspondence between Head's reconstruction and the recovered elements as figured in his paper. Accordingly, I have taken the liberty of slightly modifying the prefrontal and postorbital region. Since the problem is almost certainly at my end, I have retained the outline deduced by Head. The abbreviations used are as follows: d dentary; j jugal, m maxilla, n nasal, pd predentary, pf prefrontal, pm premaxilla, po postorbital, q quadrate, qj quadratojugal, sa surangular. The foundation of the skull of Protohadros are the two tall columns formed by the quadrates at the rear of the skull and two massive, anteriorly elongated, pyramidal maxillae at the center of the skull. Because both the maxillae and the quadrates have a number of articulations, their precise shapes are very complex. However, as a first approximation, they are a set of vertical columns (the quadrates) and a set of horizontal columns (the maxillae) which stabilize the skull in those two dimensions. These two paired elements anchor the skull. Except for the rostrum (the "muzzle"), which supported only on the maxillae, and the occiput, which is supported only on the quadrates, all of the other skull units can be understood as bridges between these two pillars. The dermal skull can then be conceptualized as shown in Figure 2. The elements shown in yellow make up an upper arch (or double arch) often referred to as the skull table. In addition to the prefrontal and postorbital in the figure, the arch in life would include additional dermal bones. The lacrimal is the missing trapezoidal bone at the front of the orbit. The missing "tooth-shaped" block at upper rear of the skull is made up of the squamosal and parietal. In many archosaurs, the parietal is a large element which "caps" the skull. In advanced hadrosaurs, the parietal tends to be a fairly small, thin element separating the upper temporal fenestrae -- yet another pair of holes which are located on top of the head just in front of the quadrates. The squamosal dominates the posterior of the upper arch and significantly overhangs the quadrate at the posterior margin. The (missing) lacrimal is primarily supported by the jugal. It apparently contacted the jugal just forward of the jugal-maxillary articulation, then overlapped onto the apex of the maxilla. The lacrimals themselves are missing, but one of the maxillae preserves the articular surface. The maxilla includes a slot for the bottom of the lacrimal which prevents it from sliding forward. At the other end of the upper arch, the (also missing!) squamosal is, in other hadrosaurids, believed to have formed a synovial joint with the top of the quadrate: that is, a membrane-lined joint that may have permitted a noticeable range of motion around the axis of the quadrate. The motion would have been limited. A flange extends out from the side of the quadrate towards the midline i.e. into your screen fro the left quadrate in the figure) which would have prevented extensive rotation. Finally, this region was also the origin of the major jaw adductors, the critical muscles responsible for closing the jaw. The upper arch is shaped as a double arch and, in other archosaurs, there is a significant vertical bar between the orbit and the lower temporal fenestra behind it. In hadrosaurs, the contact between the jugal and postorbital is always slight. Presumably this contact was also at least somewhat flexible, since it is otherwise hard to see how the postorbital-jugal articulation could have taken any significant stress without shattering. The central bar is formed by the jugal and quadratojugal. These elements were preserved in Protohadros, although they are somewhat distorted. The jugal had, as is typical of the group, a broad medial contact with the maxilla which was probably fairly inflexible, as were the articulations at the posterior end involving the quadratojugal and the quadrate. On the other hand, as is also the case in most hadrosaurs, the jugal is thin and does not seem to be fixed at all towards the center. Therefore, it seems likely that the jugal could bow outward by a measurable amount. Even for a hadrosaur, the lower jaw of Protohadros is impressive. The dentary accounts for most of the mass. "Behind" (i.e. medial to) the dentary, the inner surface of the lower jaw was covered in part by an angular (not recovered) which reinforced the dentary - surangular articulation. A large coronoid process rises vertically from the dentary for the attachment of mandibular adductors. The size of the jaw may relate to the size of the maxillae, which were also outsize for the group. For a hadrosaur, Protohadros had a longish tooth row, possibly because the maxilla was so large. As a result, the dentary is equally stout to support the corresponding (36) tooth rows in the lower jaw. Note that a heavy anterior jaw would actually help stabilize the jaw in action. The jaw swings open on the relatively gracile surangular - quadrate articulation. However, the adductor muscles act on the coronoid and on the main shaft of the dentary less than halfway along its length. If the body of the dentary anterior to the adductor attachment were light or short, there might be a tendency to dislocate the jaw when the adductor muscles were working hard and the mouth was open. A long, heavy dentary anterior to the muscle attachments tends to generate an upward force on the surangular when the jaw is open and thus stabilize the surangular on the joint with the quadrate. The rostrum in hadrosaurids is certainly their most peculiar feature. It is made up of the nasals and the recurved premaxillae. For convenience, the predentary is included as well, although it is mechanically part of the mandible. The anterior ends of the premaxillae are roughened and vascularized. As a result, there is a solid consensus that it was covered by a horn beak of some kind. The predentary is a neomorphic bone unique to the genesaurs which bears the same type of surface. Therefore, it is generally felt that the hadrosaurs had upper and lower beaks which probably were sharpened and served to slice off vegetation which was then fed through the dental battery by muscular cheeks. Much of the nasal of Protohadros is missing, but the rostrum itself seems to have been constructed along the same lines as in most hadrosaurids: a pair of facing, interlocked tripods. The principle mass of each premaxilla is found in two processes which ascend the line of the maxilla: (a) a lateral process which contacts the maxilla (more so in Protohadros than in most because of the size of the maxillae) but is offset from the midline and (b) a dorsal process which follows the midline of the skull, but is raised above the maxillae. Since the dorsal processes of the two premaxillae meet at the midline, the result is a 3-pronged structure. Each of the three prongs joins a corresponding element of the nasal at a scarf joint, as shown in Figure 3. In addition, the maxillae bear dorsal processes which insert in the bottom of the rostrum and provide further support (again, more so in Protohadros than in most). The result is a remarkably strong, flexible structure which may have absorbed the considerable stresses generated by the beak in any number of ways, since it was capable of bending, torsion, and sliding depending on the anatomical details of the species. Ultimately, the forces could be directed against the mass of the maxillae themselves or back, through the upper or lower arches to the quadrate. For this remarkable piece of engineering alone, it is no wonder that the hadrosaurs were such a successful group. It is important to remember that this description has omitted two important skull units: (a) the palatal bones and braincase and (b) the occiput. Conceptually, these form a central, internal bar through the center of the skull and a cross-bar between the two quadrates, respectively. However, even without these elements, we can make some slightly educated guesses about Protohadros and hadrosaurids in general. One of the critical issues about hadrosaurids is the extent to which they were capable of lateral and longitudinal jaw movements: side-to-side and antero-posterior movements. This is important because such movements allow the animal to grind food, not simply to slice or crush it. As Head concludes (albeit for slightly different reasons), Protohadros seems capable of both to a limited extent. Or, rather, our examination of the dermal skull suggests that its design was capable of tolerating such movements. The central bar seems fairly stiff, but capable of bulging outward in response to compression. The upper arch is similarly designed to flex upward, although the critical squamosal is missing. Again, the dermal skull will not tell us if or how compression was achieved, but it does suggest that the skull was adapted to accommodate such a force and that it might well have resulted in a longitudinal grinding action with the teeth. A second, and far more tentative, suggestion from this osteological tour is that Protohadros may not be quite as basal as Head asserts. Head's conclusion is based on the usual parsimony analysis. The difficulty is that, as we have seen, there is really less here than meets the eye. That is, much of the cranium is preserved, but the missing pieces tend to be unusually important. Unfortunately, this is true of a number of early hadrosaurids. However, Head was able to perform the analysis with 20 characters and 9 species, although two specimens (Probactrosaurus and Gilmoreosaurus) have considerable missing data. Even here, at least one of the characters is debatable. For example, Protohadros is scored as not having "dorsoventral expansion of the rostral end of jugal." In fact, the rostral ends of both jugals are fairly broken up. The left jugal is obviously missing most of the rostral end. The right has been sagitally sheared, and the rostral end is uneven, so that its dimensions are unclear. Further, as Head notes, this bone has clearly been deformed, so that it may be unsafe to draw firm morphological conclusions. Head recovers only one apomorphy for Protohadros, a relatively large "maxillary diastema", i.e. a portion of the anterior maxilla which is toothless. It is unclear how meaningful this is. First, Protohadros has a very large pair of maxillae. It is unclear from the text and figures whether the size of the diastema is being determined as an absolute size, or relative to the size of the maxillae and, in either case, whether this potentially ambiguous criterion was consistently applied across the various taxa in the study. Second, it is unclear how significant this character is, since the advanced hadrosaurines, which Protohadros otherwise generally resembles, have the same characteristic. These are probably quibbles. Protohadros clearly lacks a substantial suite of synapomorphies present in all other hadrosaurids, and these observations should not be taken too seriously. The bottom line is not that Head's conclusion is wrong, but only that we are as yet some distance from understanding the shape and origin of the hadrosaurid family tree. ATW 000704. Range: Early to Late Cretaceous of North America, South America, Europe & Asia. Hadrosauroidea:: Altirhinus + * : Hadrosaurinae + Lambeosaurinae. Long, narrow skull; $? laterally expanded distal rostrum ("duck bill") [H98]; broad, flat bill overhung by horn rhamphotheca from premaxilla, extending out & down over lower jaw; $ expanded dorsal process of maxilla, with migration of antorbital fenestra to posterodorsal surface of maxilla [H98]; cranial crest from nasal and recurved premaxilla; cheeks very likely; $ modified pleurokinesis, with jugal-lacrimal joint rather than lacrimal-prefrontal [N90]; free palpebrals (i.e. palpebra with free distal end); fused, generally small parietal; squamosal overhangs quadrates; $ medial jugal loses articulation with ectopterygoid [H98]; expanded anterior jugal [H98] ; jugal with elongated postorbital contact [H98]; posterior process of jugal forms long scarf joint with quadratojugal (indicative of lateral flexing of cheek in chewing) [H98]; quadrates gracile, with narrow mandibular condyle [H98]; (possible $) paraquadratic foramen absent [H98]; predentary present; dentary large, with tall, sometimes recurved coronary process; angular positioned medially [H98]; surangular foramen absent [H98]; prominent diastema between predentary and 1st dentary teeth [H98]; complex dental battery with 3-5 teeth per position & up to 5 replacement teeth; 40+ tooth positions [H98] ; $ teeth crowns firmly cemented together to form dental battery [N90]; dentary teeth symmetrical around a medial carina [H98]; dentary teeth small compared with iguanodonts [H98]; teeth bear enamel only on non-articulating face; softer dentine wears against opposite teeth with self-sharpening; massive, triangular maxillae; unique jaw motion with lateral & longitudinal motion; entire front half of mouth (premaxillae and part of maxillae) toothless; about12 cervical & 8-12 sacral vertebrae (not all fused to pelvis); tail and much of dorsal vertebral column strongly stiffened with frequently ossified tendons; scapula with long, dorsally expanded blade; coracoid small; long forelimbs; $ humerus with S-curve [N90]; $ humerus with strong, extended deltopectoral crest [N90]; $ reduction of wrist bones, with carpals reduced to 2 small, rounded bones [N90]; loss of fused carpus [H98] ; $ loss of metacarpal I [N90] and entire manus I [N90] [H98] ; digital pads on manus; $ ilium with large antitrochanteric process [N90]; femur with "fully enclosed" ?) anterior intercondylar groove [N90]; hoof-like unguals; skin impressions show interlocking polygonal tubercles in various patterns; midline frill along back & tail. Maiasaura eggs, nests & embryos: altricial young. Image: Saurolophus angustirostris, courtesy of (& much thanks to) mathematical.com. Notes:  As discussed in the essay, an alternate definition of Hadrosauridae takes in a number of more basal hadrosauroids which are neither hadrosaurines nor lambeosaurines. These Notes initially used the latter definition, as does Head (1998). However, this usage now (2/02) seems unworkabley vague. Some editing has been done to conform the Notes to the stricter definition, but there are undoubtedly remaining references to "hadrosaurids" sensu lato. Head disagrees. He ascribes these views to Forster, CM 1997), Phylogeny of the Iguanodontia and Hadrosauridae. J. Vert. Paleontol. 17: 47A. Links: DinoData: Hadrosauridae; Hadrosaurus foulkii: 1858; Literature - Hadrosauria (literature); Hadrosaurian Dinosaurs; Lecture 20: Late Cretaceous II; Cladistic Classification and its Applications in Dinosaur Paleontology; HADROSAURIDS; Untitled Document. Hadrosaurs - Paleontology and Geology Glossary brief, good discussion); HADROSAURIDS brief, oversimplified discussion); Pretty Butte Paleontology- Catalog of Hadrosauridae Fossils some good details of individual bones); DINOSAURS- Family Hadrosauridae very good discussion); hadrosauridae.htm Thescelosaurus! site with quality discussion); 13-2 art); Hervíboro Ornitísquio Cretácico tardío (65-97 millones años ... Spanish: with basic anatomy); Hadrosauridae German). References: Head (1998) [H98]; Norman (1990) [N90]; Weishampel & Horner (1990) [WH90]. ATW030721. Hadrosaurinae: Anatotitan, Edmontosaurus, Gryposaurus, Hadrosaurus, Lophorhothon, Maiasaura, Prosaurolophus, Saurolophus, Shantungosaurus. Hadrosauridae : Lambeosaurinae + *. Characters: Generally larger than lambeosaurines [C+99]; reflected premaxillary lip; snout wide; nares very large; depression around nares extrending onto nasal; cranial crest absent or low & solid; basioccipital excluded from foramen magnum; teeth broad and low; no marginal denticles; neural spines low; slender limbs; narrow prepubic & ischium; ischium reduced distally; possibly prevalent in more open environments than lambeosaurines [C+99]. Image: Maiasaura from the Wittmer Lab.. Links: DinoData Classification Hadrosaurinae; Witmer's Lab Dinosaur Skull Collection: Other Ornithischia; Hadrosaurinae; Biologybase- Family index to Dinosaur checklist; Hadrosauridae- Hadrosaurinae Mikko's Phylogeny); 13-2 Shiraishi's reconstructions); Stars of the Show (A to I) (several good images, see the skin impression); Hadrosaurian Dinosaurs UCMP -- the usual solid, but elementary stuff); DinosauriaN UNGULATES (ORNITHOPODS) (November 12) excellent lecture notes); .-Dinosauria-. Spanish: brief, but well done & well illustrated, with emphasis on anatomy); .-Dinosauria-. same site in English). References: Carrano et al.. (1999) [C+99]; Head 1998) [H98]. ATW021122. Hadrosauridae : Hadrosaurinae + *. Characters: generally smaller than hadrosaurines [C+99]; $ premaxillary foramina absent [H98]; premaxilla completely surrounds nares; $ anterior maxilla reconfigured as broad medial shelf to support premaxilla [H98]; maxilla contact with jugal truncated, rounded; completely separate nasal passages; nasal passages in supraorbital position; expansive hollow crests in adults; exclusion of frontal from orbit; short parietals; anteriorly bowed quadrates; basioccipital participates in foramen magnum; tall neural spines; caudal spines very tall; humerus robust; deltopectoral crest projects laterally & distally; ventral sacral ridge (? ); ischial foot present; crest developed post-natally; sexual dimorphism [C+99]; possibly prevalent in more closed forested) environments than hadrosaurines [C+99]. 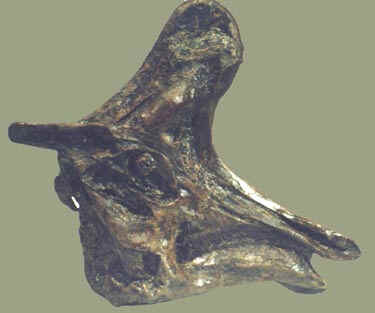 Image: Lambeosaurus skull from Research Casting It reminds one a great deal of Baron Samedi, a Voudou lwa. Links: DinoData Classification Lambeosaurinae; Hadrosauridae- Lambeosaurinae Mikko's version of the same); 13-2 M. Shiraishi's reconstructions); Re- Javelina Hadrosaurs [was- Re- Hadrosaurs etc] nomenclature); Hadrosaurs - Paleontology and Geology Glossary simple definition and examples); DinosauriaN UNGULATES (ORNITHOPODS) (November 12) superb lecture notes: Best on the Web); Freeman-Lynde GEOL3350 Chapter 10 Notes functional speculations on nearial crest). References: Carrano et al.. (1999) [C+99]; Head 1998) [H98]. ATW030802.